If you're anything like me, you have a piece of furniture in your house that just exists. You don't love it; you don't hate it; but it's always been there, so you don't really think about what it could be. When we were packing up our things to move, I realized that this was that piece. It wasn't terrible, but it wasn't great. It had survived one move and was getting dirty and didn't have much of a purpose other than clutter-support. 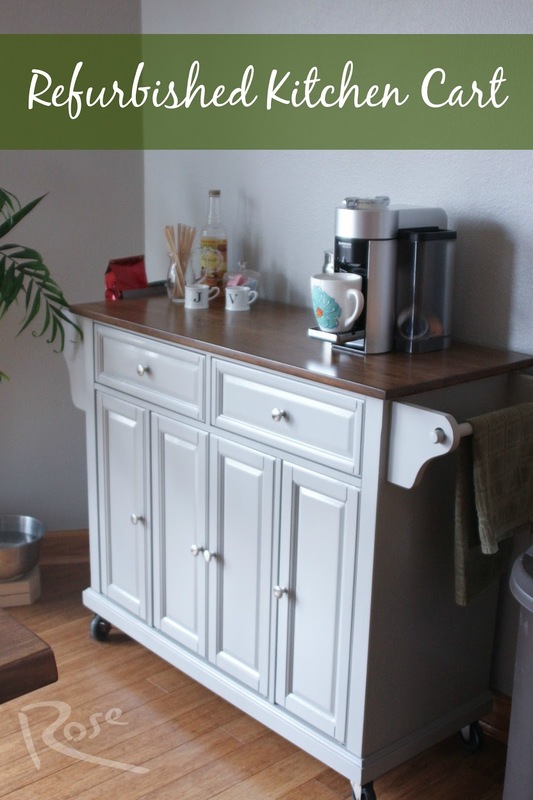 My hubs and I decided we could make it work as a coffee-bar in our kitchen, but it would need some TLC to fit in at our new home. First things first- I made sure to keep all the hardware together that we had removed. This thing would need a new paint and stain job and this makes it SO much easier! And thanks to my loving hubby, he sanded down the top to perfection. Thankfully, we had some stain left over from the table he created, so in my head, that means free stain! I already knew it would tie in well with the kitchen, so after about 3 generous layers of stain, we had an amazing transformation in the works! If you want to do this to any drawers or cabinets- removing them first speeds up the process immensely! Three cans later, it's a real beaut, Clark! I love how it looks in our new kitchen and we finally have all of our coffee essentials in one place! Now, I have big plans for the wall above the coffee bar, but that's a story for another day! Tragedy struck yesterday when we ran out of vanilla syrup for our lattes! Talk about your first-world problems! I was shocked the last time I purchased a bottle, since I don't think vanilla syrup is worth $7.50. Thankfully, the internet exists and I was able to quickly find a simple recipe that only uses three ingredients that I already have! That's it! You pretty much make hummingbird food for your coffee! All you have to do is stir together the sugar and water over medium heat until the sugar is completely dissolved- it should be clear. Just store it in a sealable bottle- I used a vinegar/oil container with a sealing lid and it fit perfectly! Store it in the fridge and you're good to go! I read that this should only keep for 2 weeks, but correct me if it will last longer, as it seems it should! The day of my last post, I was doing a final edit from the hospital. We sat in the maternity center waiting room as my bro and sister-in-love awaited the arrival of their first child, sweet little Anaelle Nicole (uh-nell). While I've been an aunt ever since my wedding, I've never actually been there as a family member has been born. I can't tell you how much love I felt since the moment I first held her. She was born at 1:50 p.m. on March 5th. She's a tiny little thing, weighing 6 lbs 4 oz at the time and only 18 1/2 inches long! And the sweetest thing from the day, besides Anaelle, was watching my brother be a loving husband to his wife. It was so sweet seeing him get her water, or chapstick, or brushing the hair from her face. And then the world changed as I watched him become a father and he instantly fell in love with his little girl. Absolutely adorable. She is now just over a week old, and I was thrilled to go do a photoshoot at their home! Oh my goodness, I can't get over those tiny little fingernails!! This rocking horse used to be in my brother's room when he was a baby! I LOVE the incorporation of scripture on the wall and in the artwork. Someone in the area puts storks in yards for new babies! How cute! Just look at those tiny little feet! I'm sure I'll go a little crazy with photos in the future, but this is just so much fun. I've never really had the chance to do a full infant photoshoot, so I can't wait to spend some more time with her and capture some amazing moments! I hope everyone is having a beautiful weekend. I'm so excited for everything God is doing in our family right now and I can't wait to see what He has in store for this year! Moving is always portrayed as such a dramatic event. It was completely foreign to me, having only really half-moved once, so I approached it with a mixture of excitement and dread. My mind kept flashing back to that scene in "The Incredibles" when Helen is thrilled to unpack the last box... after having moved in three years prior. That's how I imagined it would be: I had every pin tacked on my Pinterest board, I was planning out the color that would go on each box and was ready to write out a numbered list of what was in each box. My hubs assured me that was all unnecessary and told me we would be done in 2 days. I scoffed like you probably are now, but he wasn't too far off. We were pretty much settled and completely unpacked on day 3, thanks to incredible friends and family! We would probably still be unpacking if it weren't for them. Granted, we don't have any kids and my husband is the opposite of a pack rat, but that's pretty fantastic! As I stood behind the truck on moving day telling our crew where each item went, I asked them for some tips for moving and if color coordinating would have been helpful. They seemed obviously amused and said the easiest thing is just to associate a number with the room and match that with the box. I just stood there saying "1, 3, 2, kitchen, 3, 1, downstairs, 3..."
I was, however, very happy to have written the box destination on the top and sides. They stacked them all up on a dolly to distribute and I wouldn't have been able to see anything on the tops. If I were moving somewhere farther than across town, I probably would have numbered my boxes as well, just to be sure I had everything in one fell swoop. At the request of a few friends, I went around taking a few photos today of some of my favorite parts of the house. Some of my favorite things aren't worth taking photos of, though, like the main level washer/dryer, soft-close drawers and cabinets and lighted carpet stairs to the basement. The couple who owned the home prior to us designed it themselves, so they thought of tons of details: even a whole-home audio system, dimmable lights, a nest thermostat and a central vac. I feel super spoiled this week! Gas fireplace with cathedral ceilings? Woohoo! We really wanted an open main floor, so the kitchen connecting to the living room is perfect! My hubs framed in this mirror and it turned out to be amazing! LOVE these mason jar pendant lights! The previous owners built this little kid-house under the stairs, so when we do have kids, they get the perfect play place! Wookiee approves the kid house! Happy to have a use for our old entertainment center: book and record holder! Our bedroom is a bit patriotic with a few items from our wedding, like the sign and bouquet. I have lots of these crates, which I love! So I'm trying to find a temporary use for them. Craft and photography storage works! And we're all set in the living room with our gaming boxes. My hubs is thrilled to have access to the Xbox 360, Xbox 1 and Wii all at once. :) We've already had some evenings of playing Mario to break in the new home (and we're horrible). I almost don't know what to do with all this space! I can hardly wait to have people over and start planning a housewarming party!